Shanema homes is a ‘home away from home ‘ideally located within Nairobi’s tranquil Gigiri area just a few minutes drive from the city centre. Its is 200 meters from United Nations headquarters in Nairobi and a few meters away from the village market shopping mall. Facilities - Media lounge .Gazebos. Conference facilities. Secure Parking and a well manicured garden. Services - 24hrs Wi-Fi internet, study desk and chair in each room, TV in each room fitted with Dstv, we organize long safaris, weekend getaways and daily excursions. 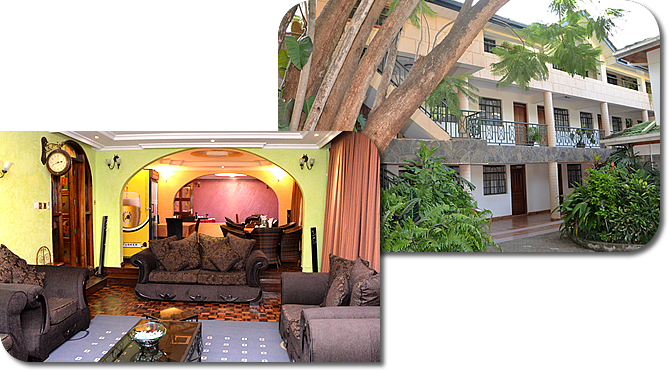 Shanema Home’s perfect location caters for both the short term and long term holiday and business visitors. It is minutes away from attractions in Nairobi: The Nairobi National Park, David Sheldrick elephant sanctuary, Nairobi Safari Walk, the Nairobi animal orphanage and giraffe centre. Accommodation - Consists of 25 self contained rooms with double, single and twin beds all with modern bathroom facilities. Cuisine - We serve English breakfast and menu meals with a taste of various international cuisines including continental, Mexican, Chinese and African. A short walk to the village market shopping mall offers a wider variety.